Landscape Garden Maintenance We are a team of professionals providing all phases of garden care, annual, perennial, mixed bed, cutting style and vegetable gardens, as well as complete rose care. Organic pest control and integrated pest management services provided. Planters & window boxes designed and maintained. We speccialize in ‘hard to find’ plant materials. Landscape Garden Installation We start with site and soil analysis. 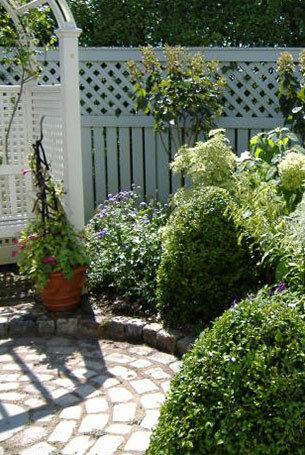 Then we develop garden themes and designs to suit your individual style and island location. My plans incorporate earth friendly preparations, using materials and amendments, which are specific to Nantucket’s cultural and climatic demands. Landscape Garden Design Design consultation and bed layout drawings produced. Cost analysis and site evaluation. A good plan ensures that all uses of your property are well integrated. Options available for site work and all phases of landscape care. Sales Local and regional materials. Let us assist you in choosing local and regional materials and garden accessories. We are an exclusive Nantucket distributor for Global Pottery. Deborah is a member and supporter of the New York Botanical Gardens; Bronx NY. Cleveland Botanical Gardens; Cleveland, Ohio and the American Horticultural Society.